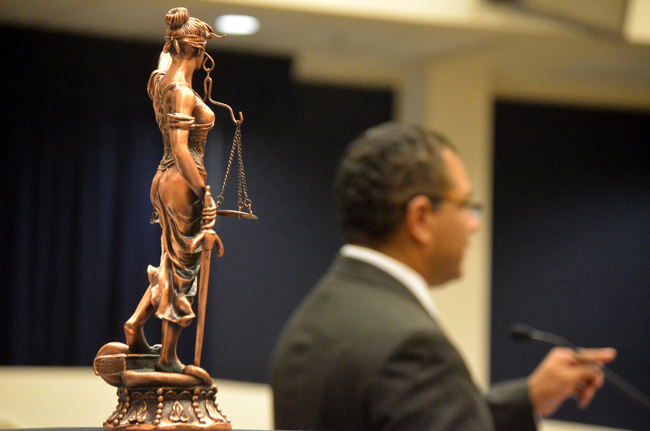 Circuit Judge Raul Zambrano in the shadow of Lady Justice at Friday's minorities in law symposium in Bunnell. It was an afternoon rich in touching moments, from a student’s reading of her essay where she graphically revealed being the target of racial slurs at tennis matches to Judge Hubert Grimes describing his ascent toward becoming the judicial district’s first black judge in 1988 to Bill Bosch, the Palm Coast attorney and president of the Flagler County Bar Association describing the discrimination his wife faced as a lawyer, whether being called “little girl” by colleagues or pressured to drop out of cases when she was pregnant, to Mark Dwyer, also an attorney, vividly recalling the history and legal consequences of the lynching of Ed Johnson in 1906. Yet none matched the moment when Circuit Judge Raul Zambrano stood before the small assembly of 30-odd people who’d gathered for Flagler County’s first annual Minority in Law Participation symposium at the Government Services Building’s main chamber Friday, and described, in a voice that twice broke, what his own journey to the bench had been like, from Panama to Flagler, and what it has come to mean, even though he’s never considered himself to be a minority. The symposium was organized by Mark Dwyer, the attorney and recent candidate for a judgeship (he just joined the firm that renamed itself Chiumento Selis Dwyer), at the behest of the Florida Bar Association. The Florida Bar is putting an emphasis on nurturing minorities for careers in the law. The local bar organized an essay contest for high school students and invited Grimes and Zambrano, among others, to speak in what turned into a two-hour event that often sounded like a small-scale graduation ceremony, with words of advice mixing with life lessons. Bosch, speaking of the totality of the essays, said he was impressed by their quality and optimism, particularly several students’ notion that diversity was a fat in law and society. And who got the scholarship and iPad? Those names have been added. Thanks for the reminder.